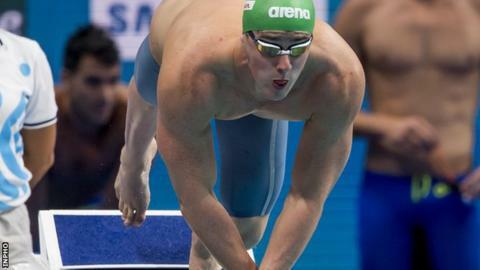 Bangor's Jordan Sloan has become the fourth Northern Ireland swimmer to achieve a nomination time for next year's Commonwealth Games in Australia. Sloan swam one minute 48.15 seconds in the 200m freestyle heats on day one of Ulster Long Course Championships - 0.66 seconds inside the Gold Coast standard. The 24-year-old went faster still in the final winning the title in 1:47.78. Sloan joins Conor Ferguson, Jamie Graham and Calum Bain in achieving a nomination standard. All four now must wait until selection takes place by the Northern Ireland Commonwealth Games Council in early January. Sloan was part of the squad that went to the Glasgow Commonwealth Games in 2014. In other action, there were victories for Larne's Danielle Hill in the women's 100m freestyle and Lisburn's Rachel Bethel in the 800m freestyle. Both women also represented Northern Ireland in Glasgow and will be hoping to achieve the times they need in their more favoured events over the weekend. Hill's team-mate from Larne, Conor Brines, 22, missed out on the Gold Coast nomination time in the men's 50m butterfly as he won the race in 24.31 but was 0.40 outside the nomination mark. Sisters Emma and Rebecca Reid from Ards Swimming Club each took one title with Emma victorious in the 50m butterfly and Rebecca triumphing in the 200m backstroke. There were also victories for Ards 16 year-old Paddy Johnston in the men's 200m backstroke, Bangor's Dan Sweeney in the men's 100m breaststroke and 15 year-old Molly Curry from Coleraine in the women's 100m breaststroke.